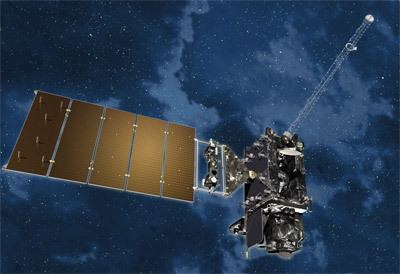 The National Aeronautics and Space Administration (NASA) announced in December 2008 it has selected Lockheed Martin for award of a contract to build the next-generation Geostationary Operational Environmental Satellite R-Series, known as GOES-R, for the National Oceanic and Atmospheric Administration (NOAA). The basic contract is for two spacecraft (GOES R and GOES S). Two options each provide for one additional spacecraft (GOES T and GOES U). The total estimated value of the basic contract including options is $1.09 billion. Data from the GOES system provides accurate real-time weather forecast and early warning products to the public and private sectors. The GOES-R mission will improve forecasting quality and timeliness generating significant economic benefits to the nation in the areas of climate monitoring, ecosystems management, commerce and transportation. Lockheed Martin's GOES-R solution builds upon the renowned A2100 geosynchronous spacecraft bus and proven precision imaging capabilities from previous remote sensing programs. The Advanced Baseline Imager (ABI) will provide key performance parameters cloud and moisture imagery for Full Disk, Continental United States (CONUS), and Mesoscale coverage for monitoring, forecasting and severe weather warning. Additional instruments include Space Environment In-Situ Suite (SEISS), Extreme Ultraviolet Sensor/X-Ray Sensor Irradiance Sensors (EXIS), Solar Ultraviolet Imager (SUVI), Geostationary Lightning Mapper (GLM), and Magnetometer (MAG). The instruments will be provided to the Space Segment A&O contractor as Government Furnished Equipment (GFE) for integration into the spacecraft. The Lockheed Martin GOES-R program office will be located at its Space Systems Company facilities in Newtown, Pa. While substantial engineering and production effort will be conducted in Newtown, the program will also leverage Space Systems Company capabilities across the country including Denver, Colo. and Sunnyvale, Calif. The options for GOES T and GOES U were exercised in May 2013 for launches in 2020 and 2024 respectively.